A boy who achieves the rank of Eagle is one who forever will be viewed as a leader, as being capable, competent and independent. You would be hard pressed to find someone who doesn’t know that being an Eagle Scout is not only a tremendous honor but also a tremendous achievement. You don’t need to even have children or have ever been in scouting to know what it means to be an Eagle. Being an Eagle Scout can also open doors for a young man, employers and colleges take notice of applications from Eagle Scouts. Getting to the rank of Eagle is a long and arduous journey; it’s not something you can complete in a week, a month, or a year. It takes years of work and dedication. And that is just to get to the point where you can start your project. The Boy Scouts of America reports than less than 2% of scouts will reach the rank of Eagle. And having just been through the Eagle process with my son I see why. I never imagined that it would take my son a year to get through the Eagle process, but it did. Along the way my son and I learned some hard lessons and hard truths. Now that he has finished his project and turned in all his paperwork I sat down and wrote a list of things that I wished someone had told us at the beginning. Qualifying the Project – Once you pick a project it doesn’t mean that what you have chosen will be approved by the advancement committee [in our Council, this approval is left to the District’s Eagle Board]. The project must first be proposed, in writing. You will need pictures, diagrams and a write up. Pictures should be printed with descriptions next to them. Diagrams should have measurements. His write up should reference photos and diagrams by number or letter for ease of reference. Not a Maintenance Project – This was actually something that I’d never heard of, that an Eagle Project can’t be a Maintenance Project. This was confusing to me and my son because most Eagle projects that I’ve seen involve building, painting or refurbishing something. Yet when my son first turned in his proposal he was told that it did not qualify since it was just a “maintenance” project. He was instructed to re-write it and to use words like “install”, “build”, and “construct” and not “re-furbish” or “fix”. The difference between an Eagle project and a maintenance project is in the write-up. Demonstrating Leadership – I used to believe that the purpose of the project was simply a giving back to the community. I did not understand how much emphasis was placed on the leadership aspect of the project. Your son will have a much easier time of getting a project approved if he has a couple of paragraphs detailing how leadership will be demonstrated during the project. This was one of the most difficult parts actually for my son because he hates writing about himself. Details, Details, Details – It’s all in the details. The more detailed the project write-up the better. My son’s project had several appendices for photos (before, during and after), meal plans for workers, safety concerns and first aid, emergency contact numbers for the work site, address and map to the nearest emergency room, work team assignments, permission slips and more. There were pre-written risk assessments and safety briefs, tool sign-up sheets, volunteer sign-up sheets, and draft thank you letters. And the workbook should be completely typed, neatness counts. The more detailed the workbook the more he will demonstrate how much thought has gone in to the project planning. Donations – Your son can accept donations for his project but again, the parent shouldn’t be the largest contributor. I did end up donating money from my company to my son’s project, but he also received other donations both cash and materials, plus he had a pizza fundraiser and the recycling fundraiser. Project Log – Your son needs to log the hours he spends on the project from the moment he decides to do a project. The day he starts looking for a project is the day he needs to start his log. My son kept a log but some months he estimated hours for some items. Your son probably has a gmail.com account (dad, gmail is so much better that all other mail programs) so have him put stuff on his Google calendar every time he does something. Save Everything – This goes along with “details”. I’ve been to district roundtables several times and seen Eagle books from a lot of scouts and was surprised how terrible many of them were, and how thin. I’ve watched as boys have explained that they didn’t save the receipts from their project or didn’t get permission slips from participants, didn’t have sign-in sheets. The more he has in his book the better. And make sure that there is at least one parent taking photos during the project work days. You Can Help – Nothing says that the parent can’t help. It may come in the form of nagging, I mean “reminding”. You may have to help make phone calls, pick up supplies, help them with drawing or with the writing of their workbook to help them find the right words. The purpose of the project is to demonstrate leadership and a good leader is not too proud to ask for help when he needs it. In the end only one thing matters; and that is that he completes his project and turns in all the paperwork before his 18th birthday. Which my son did just today. He just got back from getting the last signature from his scoutmaster and dropping off his workbook with his adviser. All that is left is his board, which really is merely a formality at this point. Merit badges signify the mastery of certain outdoor skills, as well as helping boys increase their skill in an area of personal interest. 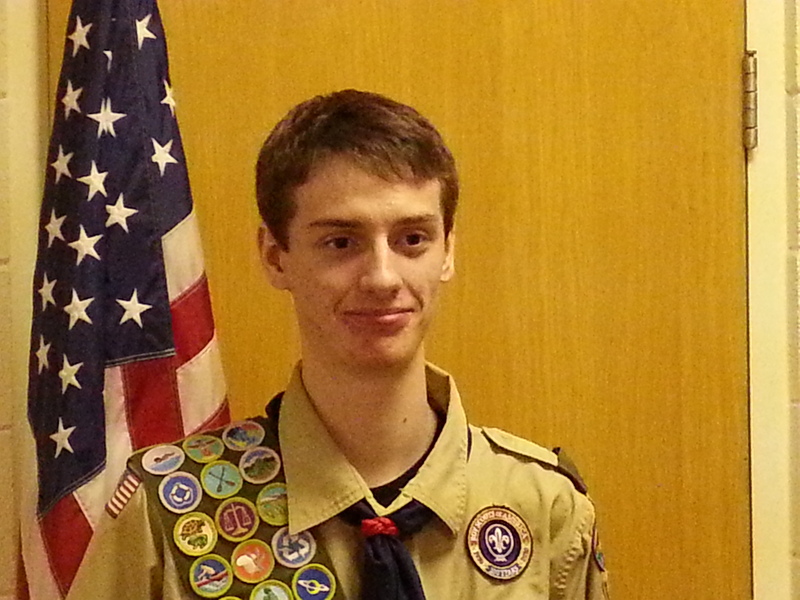 Of the 120 merit badges available, 21 must be earned to qualify for Eagle Scout. Of this group, 12 badges are required, including First Aid, Citizenship in the Community, Citizenship in the Nation, Citizenship in the World, Communications, Environmental Science, Personal Fitness, Personal Management, Camping, and Family Life. In addition, a Scout has a choice between Emergency Preparedness and Lifesaving and a choice among Cycling, Hiking, and Swimming. Troop 501 now has an Online Advancement Tracking System. The link, aside from being in this announcement, is also in the list of links, in the right column of each page on this website. There are many advantages to this kind of a system, one of which is that it allows Scouts and parents to see what kind of progress is being made. Please login as soon as possible, and review your Scout’s records. Please let me know if you find any errors in the records. While you’re there, please update the personal data for yourself, as well as for your Scout, and anyone else in your household that we have entered in the system. Advancement information is found by clicking on the “Achieve” badge, at the top of the page. Personal information can be accessed by clicking on the “Manage” badge. You will need to login, in order to view, or make any changes. Please use the credentials that were emailed to you a couple of weeks ago. If you need to have another registration email sent to you, just send me an email, and I’ll get it to you, right away. To work on a Merit Badge, you must complete a Merit Badge Application. In the past, you could get them from the Scoutmaster, however, you should now print them out, yourself, in advance, and present the application form to the Scoutmaster. It’s EASY!!! First, decide which Merit Badge(s) you would like to work on. Next, visit the Advancement Tracking System at troop501.trooptrack.com, login, and click on the “Achieve” badge, at the top of the page. Then, click on the “Print Blue Cards” link in the left column (the cards are printed on blue stock, as provided by the national printing office). Select the Merit Badge(s) that you wish to work on. Leave the Merit Badge Counselor space blank. Select your name from the dropdown menu. Finally, click the “Print” button. They print double-sided, so if your printer does not have this function, you will need to feed the page back through your printer to get the other side of the page (it is very important that this form is printed correctly). White paper is acceptable, and you need not use cardstock. Ready for a Scoutmaster Conference or Board of Review? Great! “Be Prepared!” Print a Board of Review Worksheet, and bring it to Troop Meeting with you. Click on the “Achieve” badge at the top of the webpage. From the left column, click on the “Board of Review Worksheets” link. Then, just click on your name, and click the “Generate Worksheets” button. It really is just that easy!